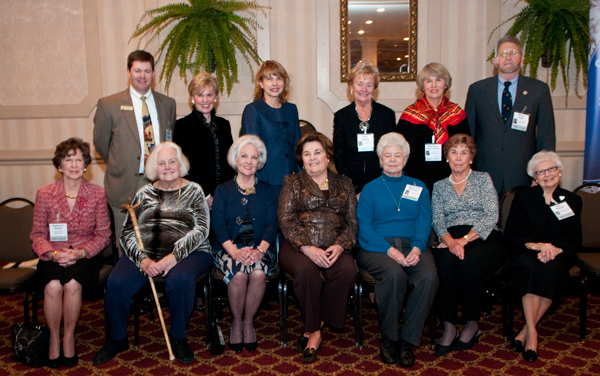 During the 2011 University of Kentucky Homecoming festivities, the UK Alumni Association celebrated the class of 1961’s 50-year reunion. The members of this class were inducted into the Golden Wildcat Society. Pictured above are this year’s inductees who received degrees from the UK College of Education: (front row, L-R) Barbara Hulette, Jane Burke, Virginia Redford, Eleanor Chenault, Marty McGregor, Paula DeBoor and Betty Hedlund; (back row, L-R) College of Education Development Director Jeff Francisco, College of Education Alumni Director Mary Ann Vimont, College of Education Dean Mary John O’Hair, Diane Stuckert, Betty Dawn Weaver Mobley and Mervyn Jones.